My favorite Final Fantasy titles are V, VIII, Tactics and XII. When I tell people that, most can understand Tactics, but they're usually a little puzzled by the other three -- V and VIII are usually considered the weakest of their generational trilogies, both occupying their respective middle slots -- and XII is mostly written off as "too different" from the rest of the series, which is a ridiculous notion considering the amount of evolution Final Fantasy has gone through over the years. 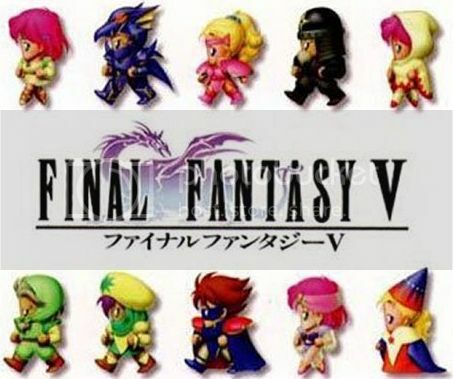 I'm not going to be talking about that now, though; I'm going to focus on Final Fantasy V.
Sandwiched between FFIV and FFVI, FFV is sort of like the unfortunate and overlooked middle child to its younger and older siblings. It wasn't even released outside of Japan until 1999's Final Fantasy Anthology compilation, and was later enhanced and ported to the Gamebody Advance in 2006. 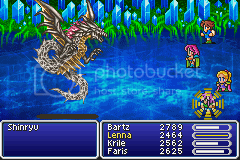 The most common complaint made about FFV is that its story is sub par. Sure enough, the story essentially pans out like FFI part 3 (part 2 being FFIII), involving four warriors inheriting the powers of the four elemental crystals and using them to destroy an evil that threatens the world. To put this in perspective, let's have a history lesson. Until the PSX era, Final Fantasy developed in a very distinct pattern. Final Fantasy I was the story of four nameless heroes bearing the power of the crystals. It introduced many of the concepts and design aspects that are still used in the series today, taking heavy influence from Dragon Quest and, by extension, early western RPGs such as Ultima and The Bard's Tale. As the first game in the series, it didn't have an overly complex plot. Then again, no game did at that point, really, as storytelling was even more of an afterthought than it is now. Still, like any other NES game, you could say it was a gameplay-focused affair -- and I don't care what delusions Hironobu Sakaguchi had about creating a compelling narrative, because on the NES, it wasn't happening. Final Fantasy II was more of an experiment. Aside from the obvious deviations in the character progression system, where your stats increased based on the frequency of certain battle actions rather than experience points and levels, it innovated the way dialog worked, allowing you to memorize key words during conversations and ask people about them to learn new information. Otherwise, though, the game was much more focused on the character-driven story than anything else; probably to save face if the experiments failed (which they did, horribly). 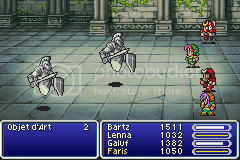 In Final Fantasy III, you start to see the pattern form. The story was extremely similar to FFI's, featuring four youths inheriting the power of the crystals. It returned to the more open, gameplay-driven style of FFI, introducing the job system, which was a genius way to implement character customization: essentially an improvement on the original FFI class system, you had four characters who could change their classes at will, rather than choosing four to start with and being stuck with them. There were also a ton of new jobs to choose from, with more being unlocked as you progressed through the story. Also new was the concept of multiple "worlds" existing on the overall map; in this case, you started the game on a large floating continent, and later, you left via airship and actually explored the much larger overworld. 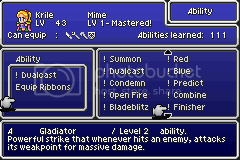 Final Fantasy IV, predictably, was more like FFII: it was character-driven, focusing on the love triangle between Cecil, Rosa and Kain, and later, Cecil's relationship with Golbez, giving us the first real "aww snap!" plot twist of the series. For its gameplay innovations, it was the first game to lock your characters into certain classes and not give you any customization options, as well as the only game in the series to allow the use of up to five party members. You can probably guess where this is going: Final Fantasy V is a continuation of FFI and FFIII. It utilizes the job system, focuses on deep, flexible gameplay, and uses the same story structure of four warriors using the power of the crystals. Though the plot is certainly more complex and nuanced than FFI and III, it's nowhere near the maturity and depth of FFIV or VI. The job system is balanced and made more accessible, eliminating annoyances like stat penalties after changing jobs until you fight x battles. It also introduces the genius that is skill learning. If you get to a certain level in any given job, you'll learn its skills -- and you can equip one learned skill to any other job (two to the Freelancer job and three to Mime). White magic on a Knight, equip swords on a Black Mage -- pretty much anything you'd want is possible here, offering extreme levels of customization and replay value. It's mainly the job system that does it for me, because honestly, when I think of Final Fantasy, the first thing that springs to mind is the job system. V and Tactics, two games that have essentially perfected it, are two of my favorite games, let alone two of my favorite Final Fantasy games. I've also played FFXI for upwards of five years, and that game uses the job system to great effect as well. There's this intangible aura about the game that gives you a great feeling of adventure, like the game is less about the characters and plot, and more about you exploring the world within it. This, actually, is the same kind of feeling I get from FFI, FFIII, FFVIII and FFXII. Other games, too, like Star Ocean 2 and Tales of Symphonia. These are games that try their hardest not to pigeon hole you into playing the game a certain way, while maintaining enough structure to not let you feel utterly lost like you would in a game like Fallout or The Elder Scrolls. They have a very unpretentious feel to them; they're more concerned with letting the player run wild than telling a great story or making some kind of social commentary. This is the building block upon which all games should be built, as first and foremost, they're supposed to enjoyable to play. Sadly, not everyone seems to think this way. It's disappointing that such an elementary concept is so rare in games, but I feel like most of my favorite games of all-time are developed with it in mind. They're the games that are not abrasive to play in the slightest; games you can always come back to and replay just because they're fun, familiar and make you feel good. 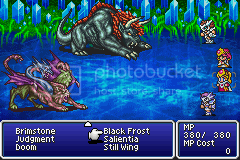 If the game can make you feel like the adventure is yours and not the character's, as FFV proves, you don't really need a terribly complex, or even good, story. The only incentive you need to keep going is the simple fact that you'll see more of the game, and when a game is crafted as well as FFV is, it's completely worth it for that alone. Another trait these games seem to share is a soundtrack that's very easy on the ears. Not necessarily good or bad, just easy to listen to -- this is something FFV has in spades, and it really brings a great sense of immersion to the game. Of course, FFV's soundtrack is certainly very good on its own, but the way it fits into the game and gives personality to its landscapes is exceptional. All three world map themes are absolutely perfect: the first, "Four Valiant Hearts," sounding appropriately adventurous; the second, "Unknown Lands," sounding ominous and dense. The final theme, "New World," sounds just like you'd expect: a combination of the two. You'd be surprised how often game soundtracks aren't done this well -- I play a lot of games where the music is so out of place that it almost hurts to listen to while playing, even if the music itself is fine on its own. 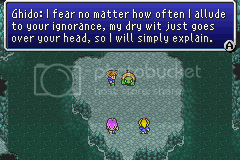 Though FFV looks like a slightly upgraded FFIV, the plot and characters are mediocre at best (though the recent GBA translation remedies this a bit with a fantastically humorous new take on the dialog), and most people overlook it in favor of IV or VI, I would argue that FFV has more personality than FFIV and more heart than FFVI. Looking at their whole packages, I would say that FFVI is a better game. 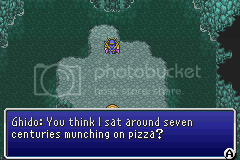 However, I'll probably replay FFV throughout my life far more than either of those games. As for why most people overlook it, I dunno. I know that most people who play RPGs are astonishingly stupid -- the concept of gameplay being more important than story is a foreign one to many. Whatever -- I'll be over here playing games like FFV, Star Ocean 2, Grandia and Valkyrie Profile while they relive their angsty teenage years watching all their favorite animated movies with interactive interludes. They can keep it.